Do you sometimes feel like your photography blog is a waste of effort? Do you spend valuable time writing posts only to find that no-one reads them? This frustrating problem is far more widespread than you might think, and the reason it happens might come as a big surprise. Do you have a photography blog? If so, that’s great—a blog can be a powerful marketing platform for any professional photographer. 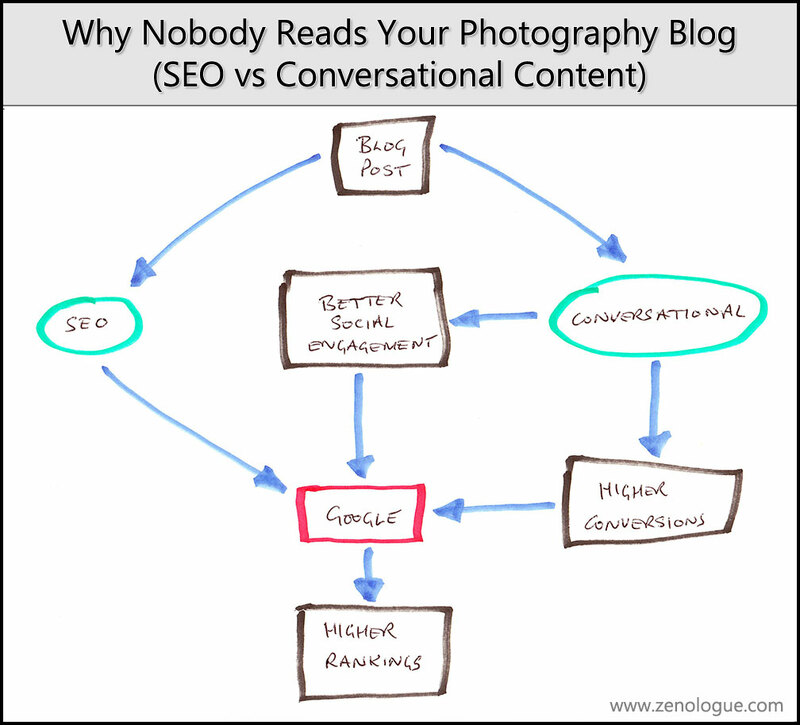 But, did you know that MOST blog posts by photographers never get read by more than a handful of people? You work hard on the actual photography you create for your clients, and they really love what you do, so you decide to invest some time (which you would rather spend with your family, or doing something fun) to write a blog post that shows off your latest creations and helps spread the word about your business. It’s not long before you discover that blogging (as useful as it is) takes time. Despite agonizing over your target keywords, wrestling with SEO, selecting just the right images, and making sure you’ve done everything that Google wants you to do—despite all that—you’re lucky if you get a trickle of visitors who seem to leave just as quickly as they arrived. If this has happened to you, or it’s happening right now, and you want to know why people don’t seem to love you online, take consolation in the fact that this is nothing unusual. In fact, it’s quite normal. And I mean “normal” in the sense that most photographers are struggling like crazy to make a decent living and they can’t get people to read their photography blogs as well! With regard to being a professional photographer, “normal” isn’t just boring, it’s downright dangerous and bordering on business suicide! Because being normal means copying what everyone else does simply because it feels like the right thing to do just because so many others are doing it, and we just don’t know what else to do instead. This is circular logic at its best, and probably how the lemmings got started. So What Counts As “Normal” For A Photography Blog? This leads to all kinds of nightmares about focus keywords, SEO, titles, meta tags, headings, sub-headings, image captions and the like. All of which is aimed at getting a mindless ROBOT to love what you do and reward you with higher search rankings. The last time I looked, photographers serve real people, not robots. There are two different—and conflicting—ways to create content on your website or blog. It’s like trying to accomplish two opposing goals at the same time, or watching a tug of war between teams of equal strength. The result is a stalemate. On the other hand, you could create content that forgoes some of the SEO elements and instead focuses more on fostering meaningful communication with your target audience. Both goals are valid, and each have their place, but it’s pretty hard to accomplish them both at the same time. Yet, because so many are under the mistaken impression that marketing means having to do SEO on everything, the “normal” way has become the “let’s keep Google happy” route. And this is giving photographers everywhere huge headaches and unnecessary stress. In reality, you’re far more likely to attract real human readers who will convert into valuable leads and clients if your blog posts actually feel more like a genuine conversation that isn’t handicapped by being overly optimized for the search engines. Whoa! Isn’t SEO Supposed To Be Important? Two different ways to create posts for your photography blog, with very different results. The traditional strictly-SEO route, where the post targets specific keywords and we follow all the accepted “rules” of good search engine optimization. Or, we could forget about SEO and simply have a conversation with our target market, very much as we would if we bumped into her in the supermarket. You can see each of those two paths marked out in the diagram above. Taking the SEO side, it appears that Google will process our content, run it through its top-secret algorithms, compare it to similar posts across the web, and then determine where to rank that content in the search results when people look for the stuff the post talks about. Except that these kinds of posts read as if they were written by someone with all the personality of a 1970’s vending machine. To other humans, it just doesn’t feel right, and all those keywords we worked so hard to stuff work into our content make it about as palatable as broccoli ice-cream to a 5 year old. Nobody wants to read it. People bounce from the post as if it’s made of rubber or contaminated with something nasty. …meaning even less traffic for your blog, and a sad spiral into the depths of obscurity. Can The Art Of Conversation Save The Day? Now take a look at the other track we could take—by focusing more on a conversational approach with the blog. Uses natural language, including the vocabulary that might be specific to the audience. Headlines, headings, and sub-headings are designed to make sense to someone and create genuine interest. Captions on images informally describe what the photograph is, or (better still) have a testimonial from the client concerned. Has a very natural flow to the narrative that makes the content easy to read. Could be read aloud without sounding stilted, forced or contrived. This kind of blog post is more likely to generate higher conversions (i.e. the reader completes the call to action you want them to) as well as have improved social engagement, such as likes, shares, and comments. You see, Google doesn’t only care about keywords these days—it’s gotten a LOT smarter than that, and is able to also better understand the meaning and readability of our content. Google knows, for instance, that certain words are related (something it’s known for a long time, actually), but it can go further than that and deduce more of the meaning behind what we’ve written. And then there are all the natural-language algorithms introduced by the Google Hummingbird updates where Google can get really clever. Additional content and interaction through comments. When Google combines this data with the typical SEO data of keywords, guess what happens? …meaning more traffic for your website and a steady climb towards success. Does Creating Meaningful Content Still Sound Too Hard? But the thing is, creating conversational blog posts is actually a lot easier than you might think. In fact, it’s an awful lot harder to be a “writer” in the traditional sense, and the folk who write novels, documentaries, company reports or in-depth research really do have a hard job. But we’re not creating any of that stuff! A long time ago, before I even became a programmer, I worked as a technical author, writing software manuals, and can attest to the fact that it was hard work and nothing at all like writing for a blog! The fact is, you’re not writing technical manuals designed to cure insomnia, you’re blogging about your photography—something you have a real passion for, right? At the risk of being blunt here, if you believe you can’t have a spirited conversation with someone about photography, about how much you love what you do, and why you can’t imagine doing anything else, maybe there’s a deeper problem that needs working on first. If such a conversation is difficult, perhaps it’s time to rethink some of the fundamental reasons why you’re in the photography business to begin with, or work on rekindling your passion for what you do. Writing a blog post for your audience should be no more difficult than writing down the words you would use if you were talking to them face to face or on the telephone. The hard part is allowing yourself to let go and write freely, to stop yourself from over-thinking everything and worrying about perfect grammar. Just give yourself permission to be you. Heck, this post probably breaks most of the rules in the book, but if you’ve read this far, it’s likely that you’re engaged in the ideas (whether or not you agree with them). Even though I’ve laid out two distinctly different approaches to writing posts for your photography blog, in practice they don’t have to be considered mutually exclusive. It’s quite possible to combine the best elements of both methods to create posts that satisfy Google and your readers equally. All that’s needed is to focus on writing for your human audience first, and then making sure you’ve covered most of the SEO bases for the keywords you want to target—if it’s appropriate. And it’s not appropriate (nor practical) to target a keyword every single time, so you really don’t need to worry about SEO at all on most of your blog posts. The final piece of advice I’ll leave you with, and I’m sure you’ve heard it said before, is that creating great content for your photography blog really is about humans first, robots second.